The economic crisis that has hit Greece more and worse than any other country in the Euro-zone does not seem to affect the development of renewable energy. On the contrary "green" energy, primarily wind power, could contribute to the economic recovery that is the common goal of both Athens and Brussels. Wind power is giving good results, currently covering 6% of Greece's energy needs. This figure places the country near the top of the European wind-power ranking, led by Denmark (27% of total energy coming from wind), followed by Portugal (17%), Ireland (13%), Germany (11%), and Spain (10%). Greece outranks the United Kingdom and Italy (5%) – two countries among the largest producers in the world in terms of absolute power, with China being the undisputed leader, but also – in spite of the windmill trademark – the Netherlands. 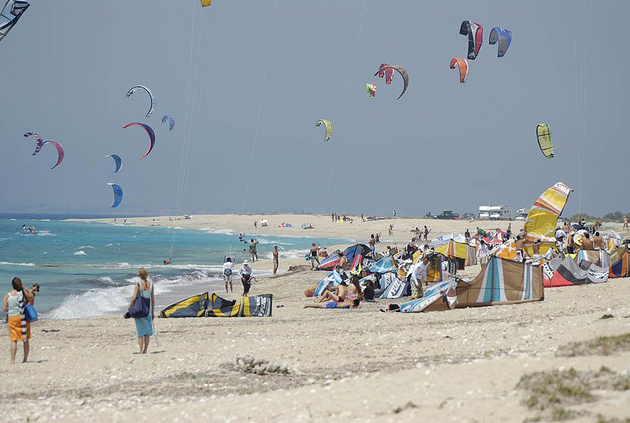 After years of investment, Greece has now 139 wind farms, distributed both in several inland areas and on the islands . The sector is expected to expand even further, especially in view of the objectives set by the European Commission in the field of climate and energy, pushing each member country to cover at least 20% of energy needs with renewable sources by 2020. The trend is also confirmed by February's statement by the European Parliament in favour of legislation requiring that 30% of the energy consumed in the EU come from renewable sources (compared to 1990 levels) by 2030. In February, the European Parliament stated its support for legislation that would imply, by 2030, for 30% of the energy consumed in the EU to come from renewable sources (compared with 1990 levels) and also for energy efficiency to be improved by 30% by the same date. Also on that occasion, MEPs also supported the proposal made by the European Commission to achieve a 40% reduction of greenhouse gases emitted by 2030. The Parliament, however, has not complied with other elements contained in the Commission's proposal: in fact, the latter had set at 27% the percentage of energy from renewable sources and this goal that was to be achieved for the entire EU and did not bind each member state. It also failed to mention the issue of energy efficiency. Now, targets for 2030 will be discussed and negotiated between the EU governments and the Commission. They might have to expect until 2016-2017 before they actually become law. On the other hand, the goals set for 2020 remain in force: a 20% cut in emissions of greenhouse gases, 20% of the energy used to come from renewable sources, and a 20% increase in energy efficiency. The last goal seems the most difficult to reach. Greece could really make it. The country is one of the sunniest and windiest in Europe, and the data show that wind power output is increasing from year to year, so that wind in the future may even be enough for domestic consumption and therefore ensure the country's energy independence. Greek wind farms produced 1,087 MW in 2009, but registered an impressive 21.9% increase in 2010 (the European average at the time was 15.6%) with 1,323 MW. In 2011, the increase was even greater – 23% compared to 2010 and 1,627 MW more. The development continued in 2012 (1.749 MW, +7.5% in comparison to the year before and investments for 150 million Euros) and in 2013, with a production of 1,865 MW and a further increase of 6.7% . 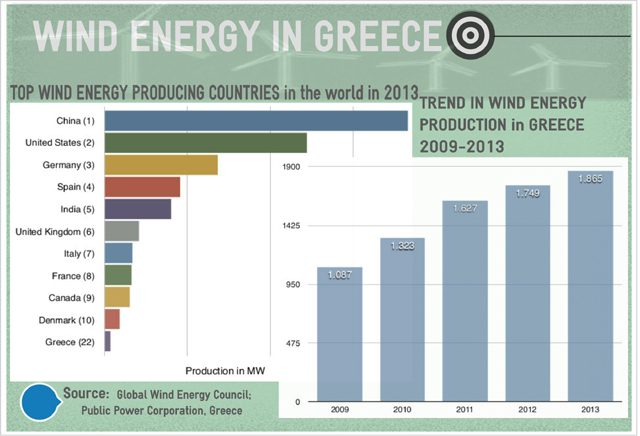 This means that wind power in Greece has grown by 80% in four years. And the goals are even more ambitious: the Greek action plan for renewable energy, which respects the RES 20-20-20 target set by the European Commission, aims to achieve, by 2020, 7,500 MW of wind capacity, 300 MW of which through offshore wind farms (on the sea). In fact, the government determined that as much as 77% of clean energy must come from wind, 11% from water, and 12% from the rest, photovoltaic in the first place. As a result, the pace of new wind farm installations can be expected to increase again. Therefore, it is easy to imagine how Greece's energy potential is attracting many investors from all over the world. The Greek territory is from this point of view one of the most interesting in Europe, as it can ensure over 2,500 hours of wind in many areas of the country. For its part, the government created a rather slender legislative framework, including pure incentives: EUR 89 per MWh (99 if the wind farm is located in the islands), decreased by 10% by the austerity tax. In this way, it has earned the trust of major investors, including giants such as Spanish Endesa and Iberdola, French EDF and Veolia, German WPD and WRE, and Italian Enel Green Power . The latter – which has been operating in Greece since 2008, with wind power as well as solar (27 plants) and hydro (5 small scale plants) – is building a new 144 MW wind farm on the island of Evia, the country's second most populated. In 2013, the DEI (Public Power Authority) submitted requests for new plants in 9 islands (Astypalaia, Milos, Kimolos, Amorgos, Kythnos, Kos, Sikinos, Folegandros, and Tilos) for a total capacity of 1,047 MW. Other actors have applied for a total of over 550 MW. For a country in which, only a few years ago, 60% of the energy came from lignite (one of the most polluting coals), the step forward is very important. And these figures do not concern only environmental protection, but also the consolidation of state coffers, economic growth and, ultimately, a further step out of the crisis.